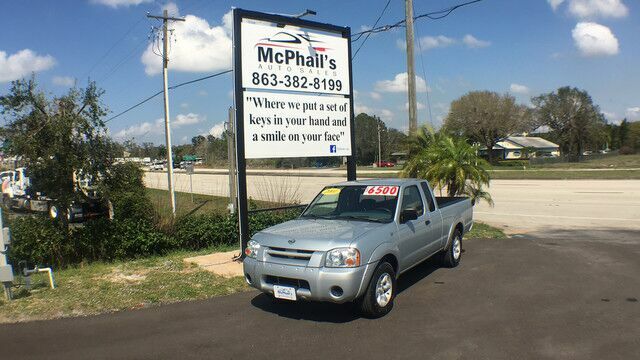 This outstanding example of a 2001 Nissan Frontier 2WD XE is offered by Mcphail's Auto Sales. This Nissan includes: 4-SPEED AUTOMATIC TRANSMISSION W/OD (STD) 4-Speed A/T A/T STANDARD PAINT (K01) BODY-COLOR PKG PKG NOT DESIRED *Note - For third party subscriptions or services, please contact the dealer for more information. * Your buying risks are reduced thanks to a CARFAX BuyBack Guarantee. This vehicle comes with an extra bonus: past service records are included. Clean interior? How about flawless. This Nissan Frontier 2WD looks like has never been used. New tires are just one more reason this vehicle is a great deal. One look at the paint on this car and you'll swear even birds honor a no-fly zone around it. This rare vehicle is a prime example of automotive engineering perfected. 5.7L Vortec 1000 HD SFI V8 Engine, 168,476 mi.